In this article we will look in detail at a 7000-year-old farmhouse from Elsloo in the Netherlands. Built by some of the first farming communities, this kind of longhouse represents the beginnings of architecture in the Northern Europe. It is argued that it has left a heritage in architectural form and function that is still evident in the historical and contemporary built environment. The key to understanding this structure lies in the nature of the trees it was built from, and the far from convenient fact that tree trunks taper. Constructing a large timber building from trees is a much trickier proposition than it might first appear, but these pioneers of timber building were more than up to the task. The structural analysis in this article has been superseded by anew article; Understanding the Neolithic Longhouse. 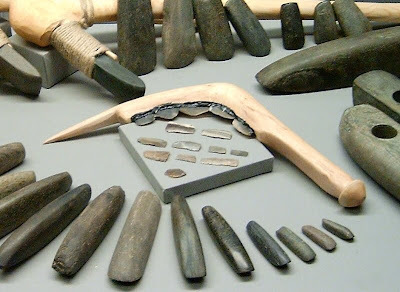 If there were a prize for the prehistoric material culture with the most number of names, it would be won by the early farmers in northern Europe, which is ironic given the uniformity of their material remains. Consensus, I think, certainly in countries where it is found, favours LBK [aka Linearbandkeramick/ Linear Pottery culture, etc. ], named after the distinctive pottery of these first agriculturalists. One of the problems of archaeological cultures this old is dating. Dates still float about a bit by the odd century here and there, and carry the usual warning: their value can go down as well as up, and historical performance is not necessarily a guide to future performance. However, in general terms, settled agricultural communities had developed in Anatolia by about 7000 BC, and spread out from there, reaching SE Europe and the Balkans and by about 6000 BC. Agriculture then spread up the major river valleys like the Danube and the Rhine to reach central Europe by about 5500 BC. 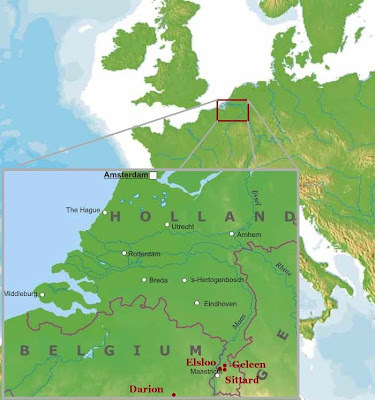 The site at Elsloo was thought by the excavator Pieter Modderman to have appeared around 5250/ 5200 BC. 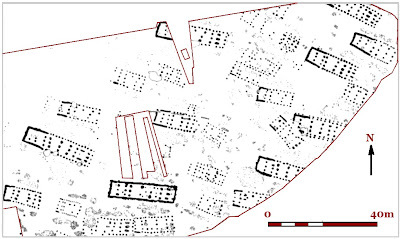 The site is typical of the area, and of LBK sites in general, excavation revealing a series of similarly aligned structures defined by postholes and bedding trenches for vertical timbers [above]. These structures usually have borrow pits running parallel to their sides, from where it is assumed the material was dug to make the daub for the walls. Most sites like Elsloo show continuous rebuilding over centuries, with the remains of many buildings spread across wide areas. Some sites were clearly defended. Darion, in Belgium, was surrounded by a ditch and timber rampart. Pieter Modderman has suggested a classification into three types based on size. The occurrence of a ‘Y’ formation of posts in the centre of the building is seen as an indication of an early type. In common with most aspects of LBK culture, these types of building and settlement occur at similar sites in the area like Sittard, Geleen, and Darion to the west. There is remarkable uniformity in width of these buildings, although length varies considerably. The orientation of the structures is also remarkably similar, with NW-SE predominating [right]. 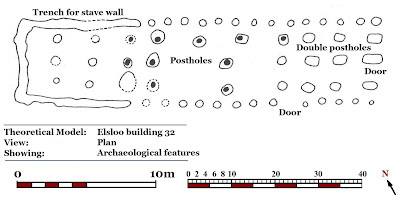 The buildings have been characterised as having three types of unit: a central one, which is always present [the one with/without the ‘Y’]; a NW end formed by a foundation trench; and an area defined by double postholes at the SE end. The loss of floor surfaces due to agricultural ploughing is a common problem, which has made it difficult to determine the different uses of individual buildings, or the areas within them. In the larger, three-element buildings, it is generally agreed that the centre section is the main working/social space, and that the main door was in the SE end. W Startin argued that the SE part was floored, used for grain storage, and that the NW section was byre, which Professor Modderman had thought was the living/sleeping area. A selection of Neolithic ground stone tools and a reconstructed flint flake sickle, in the museum of the Palatinate, Speyer, Germany. Note in the left foreground the ‘shoe–last celts’ long square section carpentry tools. 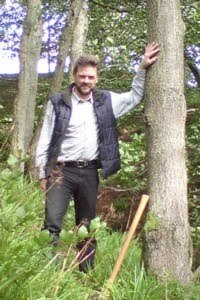 A sedentary agricultural life requires a permanent built environment, which was facilitated by two key aspects of LBK culture: firstly, silviculture, the ability to farm trees and create timber to order; and secondly, the use of ground stone tools. This was the key cutting edge technology. Axes, and in particular, chisels, were ground from hard igneous rock, particularly basalt and amphibolites. Their edges were durable and serviceable, and well suited to carpentry. 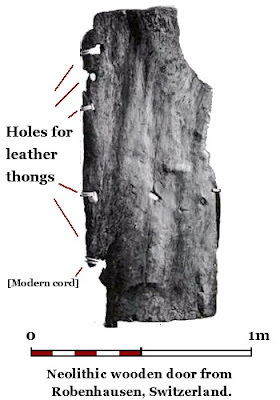 Prehistoric post and lintel architecture would have been based on mortice and tenon joints, so please put aside images of forked sticks and buildings tied together with string. The ability to routinely cut a mortice hole, of predetermined size, through a tree trunk is essential, since for reasons of rigidity, the tenon on the head of each post would joint with at least two horizontal timbers, perhaps more if bracing is considered. In Europe, from the Neolithic onwards, trees were grown, and postholes were created by a wide variety of cultures in a range of contexts. The focus of theoretical structural archaeology is working out how these trees were fitted together for each individual structure, by creating a drawn three-dimensional ‘theoretical model’ based on the known position and depth of the posts. The purpose of these case studies is to explore the methodology further while looking at real archaeological examples. It is important to stress that buildings are studied individually, and conclusions are not based on a drawing together of a number of examples from a variety of sites. 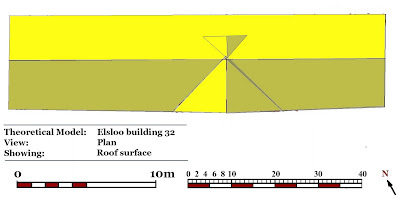 Although my data on this structure is not of the standard I would have liked, I have chosen Elsloo 32 because it has been previously discussed, and, for a 7000 year old farmhouse, is quite well known. For sake of simplicity and brevity, it is not possible to draw every possibility, or even properly explore every aspect of the methodology in each case, since it is to be remembered, this is an ongoing exercise, and issues may be returned to at a more appropriate juncture in the overall narrative of these articles. The theoretical model is a ‘best fit’ conception of something that no longer exists, but it is based on clearly defined set of assumptions, which have been covered in earlier articles. None of these ideas is difficult to understand, and they form the basis of some conception of a ‘structural literacy’ required to apply this type of methodology, to able to interpret this type of archaeological evidence. So, by way of a bit of revision, we will have another look at how roofs work, and then look at how the shape of roofs affects the positioning of the supporting postholes. This simplified model roof section represents the type of roof used in the Neolithic [left]. The posts support the tie beams (reversed assembly), which in turn support the wall plate. An arcade plate on each side and a ridge piece in the centre form the roof, both elements supported by posts. 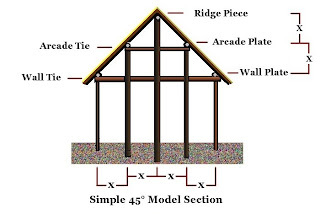 The model shows a roof with a pitch of 45°, with the arcade positioned halfway between the wall and the ridge. This makes the proportions simple to understand: ‘x’ is a quarter of the width, and roof width is directly proportional to roof height (above the wall). 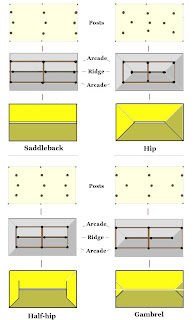 Using this simple model we can build up a surprisingly complex roof [above], which illustrates how a variety of different entrances, windows, and openings can be created based around the position of the arcade plate. By adding wings we can create complex building shapes; however, this is a feature of later periods, and I have not observed this in LBK buildings. 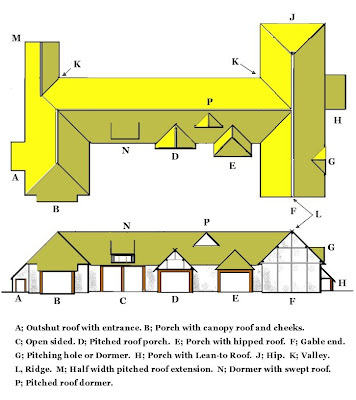 For longhouses there are four main types of roof, often used in combination, distinguished by the form of the roof at the ends of the building [left]. A plain pitched roof is known as a saddleback, while a sloping end is known as a hip; half-hip and gambrel roofs combine both types. Using our simple model, we can plot the position of the posts we might find for each type of roof. We are ignoring the wall itself, and its ties, and just looking at the roof support. The taller centre posts are offset slightly to avoid the arcade tie that runs between the arcade posts. The situation is complicated by the convenience of proximity, in that, in the our model, the arcade tie will pass precisely next to the centre post, offering the opportunity of some form of joint, thereby increasing the rigidity of the structure. In addition, there is often a need to keep posts in lines for the sake of architectural order, regardless of their height. Clearly, in this type analysis, a distance equivalent to the thickness of a post/timber is significant. When drawing in the horizontal timbers running between posts, their precise position is important, as is the precise depth of the posthole, this being indicative of height of the post. This is the essence of theoretical structural archaeology. Returning to the LBK Neolithic, we will have to work with a slightly more complex model. In reality, 45° is not a good angle for a roof. The pitch of the roof is the angle it makes with the horizontal at the wall, and 45° is probably too slack for thatch, especially in more complex roofs with valleys. In Northern Europe snow is also a significant factor, and this is another reason why steeper angles are preferred. The geometry used in the section [left] is a 3:4:5 triangle. Roofs in this proportion have a better pitch around 53°. This is a useful triangle used by surveyors because triangles in this proportion have a right angle. The model roof is formed of two such triangles; if the roof is 4 high at the centre, the rafters will be 5 long, and the whole roof 6 wide. In terms of x, 2x=3. In terms of the Elsloo 34, x is roughly 6'; so 3 = 12', 4 = 18', and 5 = 30'. That is a 24' roof base and 30' rafters. I am not being perverse; these buildings do make much more sense in feet, and they certainly weren't laid out in metres! 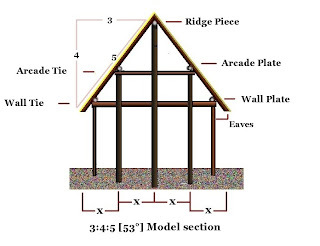 In this model, the arcade is positioned in the middle of the roof, half way between the edge of the roof, which includes the eaves, and the ridge. 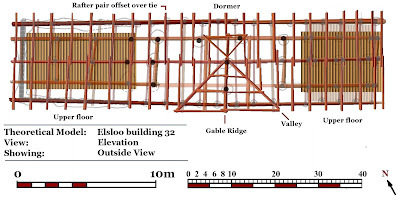 This appears to be the Neolithic practice, at least in the case of Elsloo 32, and is more structurally correct, especially since the lower half of a roof composed of tapering timbers will have an uneven weight distribution, biased towards its base. Putting the posts nearer the wall increases the size of the central area at the expense of the margins (or, technically, increases size of the nave at the expense of the aisles), but having read article 21, you’d spotted that. There is a much more significant problem which has to be considered in modeling Neolithic buildings, and that is the shape of trees. What ancient builders learnt from the god of gravity was that, if you want tall structures, you have to have wide foundations to spread the weight, hence pyramids. It was a problem that trees had solved over 200 million years earlier in the Triassic. This is why trees taper. Light competition between trees ensures they grow straight upwards, which is good news for builders; but in order not be crushed under their own weight, they taper, which is bad news for builders. The taper of the trunk will vary in different part of the tree and change with age, and may be best described as some form of mathematical curve. 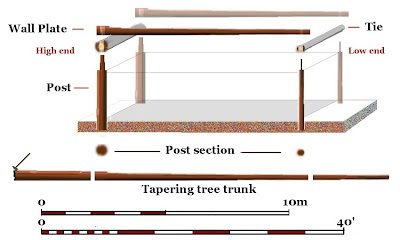 Modeling tree taper has always been of interest to those who work with trees, and has been approached from both theoretical and empirical perspectives, though the final word will undoubtedly go modern laser-controlled sawmills that now routinely record such data. In buildings longer than a single tree-length, how are tapering wall plates going to be joined? In the theoretical model of Elsloo 32 longhouse, we will try to address these issues. 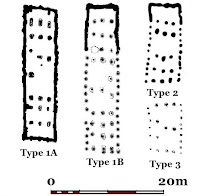 Like most buildings of this type, the structure is defined by five rows of postholes oriented roughly NW – SE, with a foundation trench for the vertical timbers of a stave wall at the NW end. The postholes in the three centre rows are generally deeper, with more complex double postholes at the SE end. Three postholes forming a prominent ‘Y’ at the centre of the building are a distinctive feature of this type of building. There are two wider spaces evident in the postholes of the wall, assumed to be doors. Note that the posthole marking the south corner of the SE wall is markedly smaller than the one at the opposite end. In the model, we place a (theoretical) post in the centre of each posthole with some regard to size, and the timbers in the bedding trench are illustrated as a continuous line of posts. 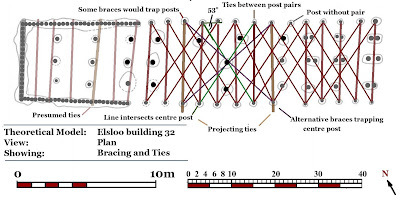 The first thing that is apparent is that ties running between the posts across the building would not intersect the internal posts, although some would be adjacent, indicating the viability of ties, the importance of which we have already noted. This may account for the odd angles of some of the ties and to some extent, the slight offset in the symmetry of the building. Ties shown at the NW end are speculative. Two of these ties project to create a side gable towards the middle of the SW side, which is how we will account for the ‘Y’ setting of posts. This gable would be slightly wider at its base than those at the ends of the building; since it is supported by ties below the wall plate, and therefore starts at a lower point than the main roof. This internal geometry is strong enough to indicate the presence of diagonal bracing at this angle, although whether every post had one, or even two, braces attached to its head is not clear. The geometry of one centre post is exceptional in this respect, in that two diagonals pass right through it [shown in green above], making a horizontal timber in this position unlikely. However, this relationship may reflect the nature of the building's initial setting out, perhaps indicating the use of 3:4:5 geometry in this process. To simplify the model visually, bracing does not form part of the drawings from this point onwards, although, in reality, bracing would be required in all planes to make the structure rigid. The wall plate would be placed above the ties, but from how many lengths of timber it would be formed is not clear. On the basis of the smaller posthole in the south corner, the model assumed this is at the ‘thin end’, while the opposite is true in the E corner. There are perhaps two main probabilities about the length of the wall plate sections: Either there were two very long sections or three shorter ones. How these long tapering timbers were ‘joined’ is also unclear. 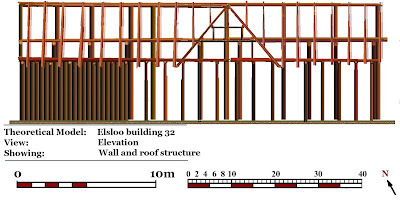 The model illustrates two possibilities using ‘long’ wall plates: either these timbers overlapped laterally at their ‘thin’ end, or they butted up against each other, which would be feasible under the side gable. To be honest, I have not yet resolved this to my own satisfaction in this particular building, and to avoid overcomplicating the analysis, we will return to this issue in the next article. 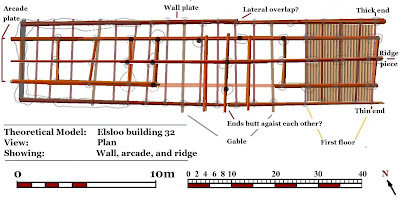 The model illustrates a first floor at the SE end below the level of the ties, on the basis that the extra postholes are not very deep, and are not under the ties, indicating they support something else at a lower level. This being the case, the building is assumed to have a two-storey elevation, with an additional higher floor level supported by the ties in the roof space. The two arcade plates with ties and the ridge-piece form the main roof structure. These timbers must have also have tapered and been 'joined', but this is not explored in the model. The roof is formed by tapering timber rafters in pairs, each pair jointed at the top, which in itself creates some degree of offset, which may be reflected in the asymmetry in the wall posts and the ties between them. This suggests that the rafters may have been placed on either side of the ties. There is a gable formed on the SW side of the building, with a pitched roof dormer shown on the opposite side of the ridge, utilising the ‘Y’ shaped post setting. The entrance next to the gable may have had its own pitched roof dormer, since the tie is missing here. Upper floors are shown at both ends of the building, supported by the ties. The final roof shape is a saddleback roof with a projecting gable on the SW side, The asymmetry of the ‘Y’ posts suggests that there is no corresponding feature on the NE side. However, as illustrated, it would be a good place to put a dormer, offering the possibility of a opening to create a through draught. The additional gable, and those at the ends of the building, provide opportunities for windows for light and ventilation. The height of the side elevation is based on the need to create a functional floor level below the wall ties at the SE end. 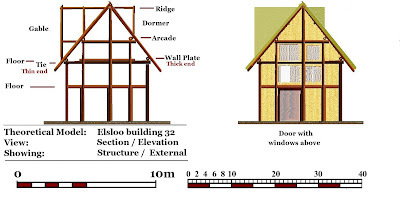 The ridge and arcade of the SW gable are not directly supported by posts, but by additional timber framing supported by the wall plate. The position of two doors is shown, one as noted on the original plan, and a second possible door next to the stave wall at the NW end. The model illustrates windows at two levels in the projecting gable to allow for light and ventilation of the open central section. I suspect that there may have been some form of dormer over the door, and perhaps a more complex roof or window arrangement associated with the floors at the SW end. 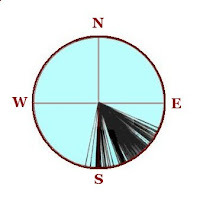 When viewed in section, the position of the post supporting the ridge piece is not central, but offset to the NE. However, (and this is important) this would balance up the building section; the thinner, lower end is further away from the ridge, and the higher end closer to it, which is how it should be to create a symmetrical roof pitch in this situation. This resolves the problem of tapering wall plates, at least in section; quite how this works in plan we will return to in the next post. 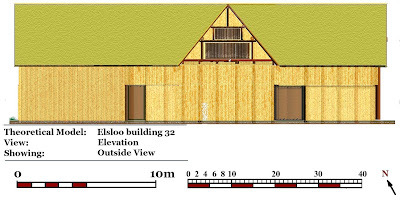 The elevation shows the door placed in the wider gap created by offsetting the post supporting the ridge; above this, both of the floors have windows. While theoretical structural archaeology is primarily concerned with the detection and definition of structural forms, it could be argued that function is to some extent encoded in the structure's form. 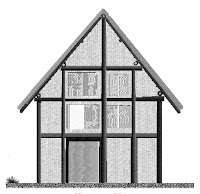 So I would like to look briefly at how the spaces defined by the model might have been used, and try to set them in the broader context of the later timber frame tradition of its descendents. I feel obliged at this point to restate one of the underlying principles of TSA: Architects create the space required by their society to protect people, activities, processes, livestock, and materials from the environment, using the building technology at their disposal, and while there may be cultural constraints, you don’t have to invent buildings. It is quite clear that we dealing with three different elements in this building, and this tripartite division is a feature of many ancient and historic structures. It is very similar in layout to a medieval building, with [in medieval terminology] a central hall open to the roof, flanked on one side by a service area, and on the other by private quarters or a solar, with chambers above. A pair of cross passages separates these sections, though not necessarily open at both ends. I would argue that the service end was at the NW of the structure, heavily built to protect intrusion by vermin and, perhaps, humans. It was a cool, dark, secure environment, as befits storage area. We know ovens were located outside houses, but other important food processing and preparation may be associated with this part of the building. The trenched construction would make drainage more difficult, an important feature if this area was to act as a byre, as was suggested by Sartin. The open hall is the principle space in the building, probably public in nature, associated with social activities, as well as providing a large covered working space, but is unlikely to be the only living space. The SE end, with its extra floor, could be the private quarters, referred to as a solar in medieval buildings. However, while there are there are no indications of animals' using this building, if it were a byre, having the sleeping quarters over it to benefit from the animals’ heat has a long tradition. In terms of its layout, the wider door and the two spaces on the NW side of the space would form an ideal byre with two stalls, eminently suitable for milking. The warm moist atmosphere typical of a cow byre is incompatible with having grain storage above. The presence or absence of animals is, of course, significant for the interpretation of other buildings found in association with these large longhouses, in particular the type 2 & 3 structures. It would be unwise to assume all building were dwellings, and if animals and their feed and bedding were not kept in the main house, they must be have been kept somewhere during bad weather, and cows require somewhere for milking. In this interpretation, people entering through the door at the SE end would pass either through the byre, or through the private part of the building, which is a little odd. In addition, in the European tradition most formal entrances to longhouses may be expected to be on the long side, a possible exception being more urbanised settings where buildings lie perpendicular to a street. This suggests that the formal entrance was the SW side, leading into a passage, with the hall on the left and the byre/solar to the right. This passage is mirrored by a similar arrangement at the other end of the building. Some form of stairs would be required to reach the chambers and lofts, and the staircase would probably be positioned relative to the passage and doors, in either a transverse arrangement, or parallel and next to an outer wall. Timber buildings are usually conceived of in ‘bays’, a unit of structural division marked by a main truss, or in this case, a tie. However, since the posts that define the outside wall are spaced at 4’ intervals, it is difficult to be too specific. The analysis above tentatively suggests that the structure could be viewed as 6½ bays, but because we have no posts at the NE end, where the half bay would be is unclear. In structural terms, the three elements effectively join at the passages – marked by six postholes. It is here the roof timbers, and quite possibly those of the wall plate, probably meet. In the theoretical modelling of building, we try not to make ‘primitive’ or ‘simplistic’ assumptions about the structure, since, working without modern engineering conceptions, builders would have over-designed. There is no need to assume that builders who were capable of conceiving of, and creating, a door, would be incapable of constructing windows or stairs. 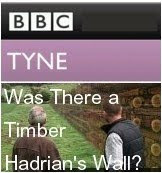 The likelihood that the processing of timber had not advanced sufficiently to produce regular timbers that could be ‘scarf ‘ jointed together did not stop builders creating buildings several tree lengths long. There is a standard width for this type of building of this period, around 6-7m. Lengthening the structure was used to create size, suggesting a conservative building tradition. For reasons you should be familiar with by now, width is a more difficult to achieve than length, and in later articles we will look buildings in the later Neolithic and early Bronze Age where there is a marked increase in this dimension. 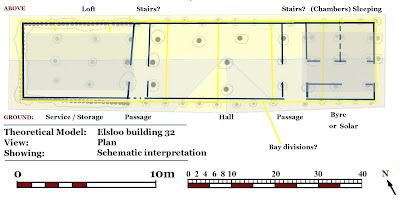 While the model leaves several issues unresolved, in particular how wall plates worked in plan, there is sufficient evidence at the SE end to indicate the structure was laid out to compensate for tree taper. Small variations in width in longhouse plans are often evident, often giving them a slightly trapezoidal appearance; this phenomenon is probably best explained as an adaptation to the taper in individual timbers. In the next post we will consider different group of Neolithic buildings with an even more radical solution to the problem of building from trees. P. Bogucki (1996), 'The Spread of Early Farming in Europe'. American Scientist, Vol. 84, No. 3, May-June, 1996. PJR Modderman (1958), 'Die Bandkeramische Siedlung von Sittard.' Palaeohistorica, 6. A. Marshall (1981), 'Environmental Adaptation and Structural Design in Axially-Pitched Longhouses from Neolithic Europe.' World Archaeology, Vol. 13, No. 1, Miscellany (June, 1981), pp. 101-121. W. Startin (1978), 'Linear Pottery Culture Houses: Reconstruction and manpower.' PPS 44, 1, pp. 43-159. Checking out your latest article I noticed that in the last line of the third paragraph you use the phrase "was thought" twice in a row. In the fifth paragraph you write consecutively "to make the daub" and the top paragraph next to the picture "neolithic wooden door from Roben..." has a couple of problems. As usual Geoff the article is a fascinating read. Thank you so much Tim, - this article is quite long enough without me repeating myself.